Hector Mancha caused a sensation when he won the FISM Grand Prix, magic’s highest honor. 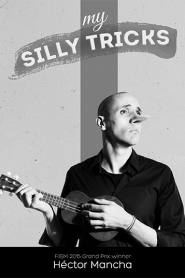 My Silly Tricks is his first and only instructional release. This wacky DVD teaches ten hilarious and eccentric effects from his personal repertoire. Each of the effects is visual in nature, and most of them are within the range of the beginner. My Magic Ukulele – You come out playing a ukulele (why wouldn’t you?!) and ask for a card to be named. You then pull off one of the strings of the ukulele and light it on a match. The string ignites and at your fingertips is the FREELY named card! This is a killer opener and there are no restrictions, any card can be named. Break the Ice – Ever wanted to be able to produce a hammer? Well, it doesn’t matter. After watching this, you will want to. This uses a a prop that you will probably have in your bottom draw and it breathes new life into it. Nobody sees the hammer coming and consequently, it is sure to get gasps! Rubber Guillotine – You take a rubber band and stretch it over your head where you leave it around your neck. It really is fully around and you can even let go of the band to prove it. Re-gripping the band, you slowly and impossibly pull it through your neck until the band is completely free. This looks absolutely impossible and is completely impromptu! Small Water Torture Cell – A card is selected and signed and replaced into a deck tied by a string. The spectator ties up a little Houdini doll with string before ties the doll to the deck and puts everything in a jug of water. When the spectator takes Houdini back out of the jug, only the signed card is tied to Houdini, the rest of the deck stays in the water! Daisy Ending – Hector takes a daisy, picks all the petals off and the head. Then creates a mini snow storm before restoring the daisy. My Card Under Watch – A brilliantly practical and clever version of the classic effect. This will fool you. Earthquake Rising Card – A completely new take on the rising card. As the deck violently shakes, somehow the selected card reveals itself. My Personal Triumph – Hector’s take on the classic Triumph plot. Done in his typical chaotic and wacky style. How you can Bend a Deck – A technique to effectively bend your deck. Sounds like a small point but this is very useful!